Club Conflict Season Twenty-One Schedule is LIVE! 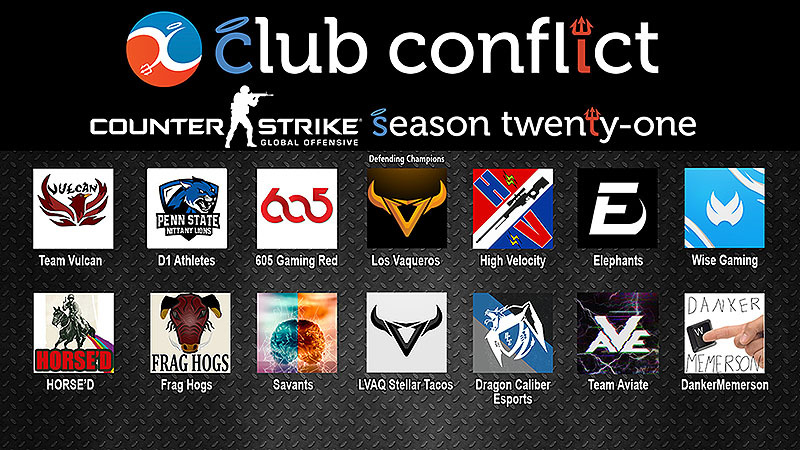 We are excited to have (14) teams competing in Club Conflict Counter-Strike Season 21. The schedule has been posted. Team Captains/Schedulers: It is your responsibility to contact your team and ensure that they can play Wednesday at 9PM EST. If your team cannot play Wednesday at 9PM EST, and needs to reschedule, be sure to contact your opponent as early as possible. Team Captains/Schedulers must contact their opponents using the built-in messaging system on the Club Conflict website. Do not contact your opponent the day of your match and request a reschedule. All matches must be played by Sunday at midnight of the week they are scheduled for. Good luck and have fun!